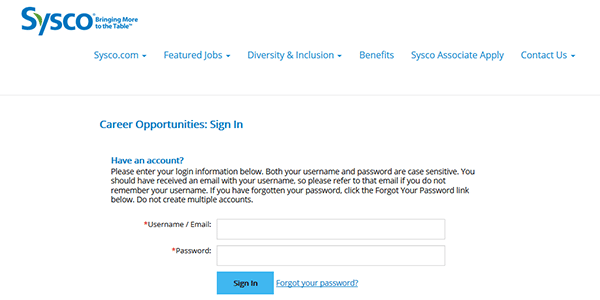 Follow the instructional guide posted on this page to learn how to access and fill out/submit the official Sysco job application (online). Numerous types of careers can be applied for including marketing, sales, operations, and support positions. The online application process will take approximately 15 minutes to complete. The guide posted below provides an overview of the process. About the Company: Sysco is an American wholesale distribution company based out of Houston, Texas. The company was created in 1969 and employs more than 60,000 people throughout the United States (as well as abroad). Sysco operates more than 300 distribution centers across the world. Step 1 – Go to the company’s main employment page. Click here to open the page in a separate browser window/tab. Step 2 – Enter a keyword, category, or job title into the first input field. In the second input field enter your location. Click the “Search” button to load the results. Step 3 – The results can be sorted by relevance or title. Scroll down the page to view all of the current openings. Click the title/link of the job that you want to submit an application for. Step 4 – Read the description of the job, and then press the button as outlined in red in the below screenshot (to go to the next step of the application process). 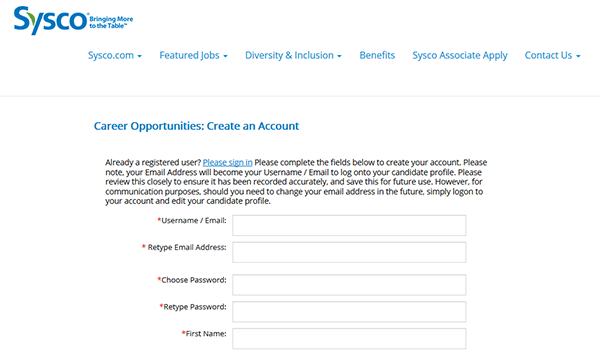 Step 5 – Press the “Apply Now” button. Step 6 – Click the “Create an Account” link below the login form to go to the account creation page.